NISSAN is more or less exclusively an SUV manufacturer these days, its range flush with high riders of different sizes. The brand's miniature Juke SUV is aimed at singles keen on something funky, while its mid-size X-Trail targets families with a few kids. 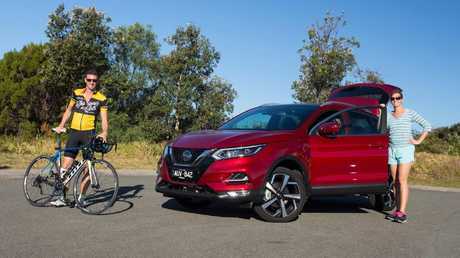 In the middle sits the Qashqai, ideal, Nissan says, for "couples with an active and busy lifestyle." Can it endear itself in top spec - and pricey - Ti guise to our family of four testers? Jules: Colourful, sharp and with just the right amount of bling, I can see why cool couples would pick a Qashqai. Iain: It's certainly a looker but to me this is the poster boy for modern faux-wheel drives. Jules: Just because it's only two-wheel drive and won't go off-road? Iain: That's one reason but it's also too small for families, expensive when dressed up like this, the engine's good for only 106kW and has a drive-dulling, fun-robbing single-speed continuously variable transmission. I'll be honest, it's not the family car of my dreams. 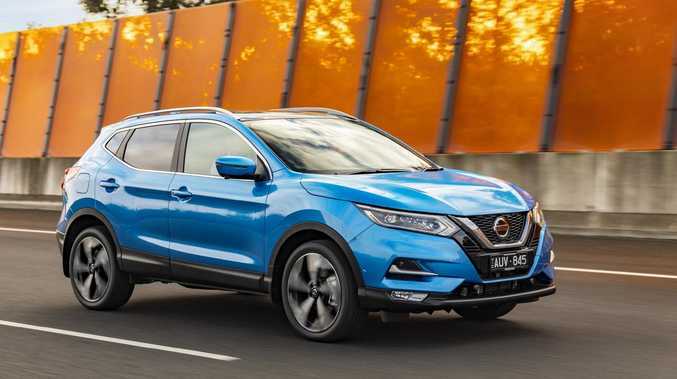 The Qashqai is bigger than most small SUVs but smaller than the average mid-sizer too. Jules: That's why it's aimed at lifestyle couples. Iain: They should get a small hatchback that drives better, goes faster and costs less. Jules: But you get to sit high in an SUV and look more on trend design-wise. Iain: At some cost though. This Ti grade is over $40,000 to drive-away. That's $10K more than a base Qashqai ST, and practically the same money as a well-equipped X-Trail ST-L - that's a seven-seat mid-size SUV. Jules: So I expect our Qashqai is full of luxuries to justify the price? Iain: It is a bit fancy, yes. Jules: Nappa leather accents for the seats, now these feel nicely premium. Iain: They're well designed and comfy, but not sink-in. And they've been given a strange kind of leather exoskeleton. Jules: They're heated and electric adjustable; we've been in far pricier SUVs without this. Iain: It is heavy on goodies. Auto headlights and wipers, dual zone climate control, satnav, lots of driver assist and a panoramic full-length glass roof. It makes for a light-bathed cabin. Jules: Infotainment feels a few generations old. No Apple CarPlay or Android Auto isn't great if you're targeting younger couples. Iain: True, and I had real trouble consistently pairing my phone with the Nissan Connect. It didn't matter whether I used Bluetooth or plugged in, the phone and audio regularly let me down. Jules: Plus a seven-inch screen feels small these days. You'd expect the top-spec model to have something special. Iain: The dash has a nice curved design and plenty of soft-touch plastics. The Ti variant is $10k more than the base ST variant. Jules: You have to say it's a pleasing thing to drive in town and the highway. Iain: If you can stay awake through lack of any driver enjoyment. Jules: Again, it's meant to transport you quietly and comfortably and it does the job there. Iain: Once up to speed, it's fine. It's well insulated on the highway, the engine is unstressed - we returned 8.1L/100km overall - and it's an easy cruiser. Tyre noise is a noticeable though, and it can crash over harsher bumps on its 19-inch wheels. Jules: The radar cruise control, where the car brakes and accelerates to follow the car in front, is brilliant for the commute. Iain: A 430L boot isn't huge for the class but, if it's a car for two, you can just drop the rear seats. The weekly shop may fit in but my pushbike couldn't without taking the front wheel off. Jules: It's not a big car so is easy to park. Plus you get a rear camera with predictive path, front and rear park sensors and excellent 360-parking camera. It's got your back at the supermarket. The top-spec Ti has a decent amount of safety tech. Iain: This is where I get grumpy. A car has to be fun in some capacity. The Qashqai neither brings back-road joy nor can take me off-road for a camping trip. Jules: The engine is a bit soft. Plus the CVT whines a bit when you floor it. Iain: It actually handles quite well and Nissan's shod it with grippy low-profile tyres. But there's no point. It's so hard to get the car up to speed. There aren't even paddle-shifters to play being Lewis Hamilton for a few minutes. Jules: It's an unapologetic suburban SUV. It won't be used on mountain passes and is as likely to go off-road as an F1 car. Iain: Positively, it's very safe with total airbag coverage, AEB, lane departure warning and intervention, blind spot warning and rear cross traffic alert. Jules: There's enough space in the rear seat for the two kiddie seats but not enough boot space for their bikes. Iain: Certainly the huge glass roof made rear seat travel more enjoyable but no rear air vents for the kids is poor form. The Ti has a more premium feel to the cabin with soft touch surfaces and leather accents. 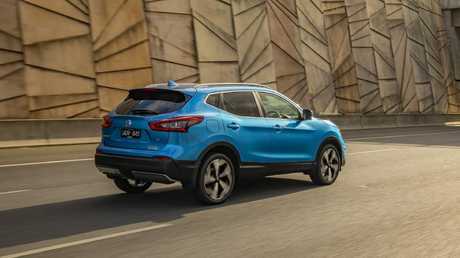 Iain: The Qashqai makes sense but not in expensive Ti grade. Favour a cheaper variant, or for the same money buy a proper mid-size SUV that's more family-friendly and could go off-road. Jules: If most of our journeys are dull school drop-offs and carting kids to activities, the trade off is getting good spec to reward busy parents. 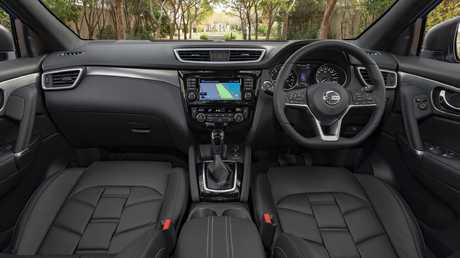 The Qashqai Ti looks sharp and the leather cabin has a premium feel. It needs more cutting edge infotainment.